Conceptualized over a decade ago, the Academies of Loudoun construction project has built a first-of-its-kind, three-story, 306,000-square-foot educational/technical facility on a 119-acre parcel owned by Loudoun County Public Schools (LCPS). Shapiro & Duncan’s scope of work on this design/assist project, which included the complete plumbing and HVAC systems, was complicated by the variety of specialized technical and vocational programs at the Academies of Loudoun. 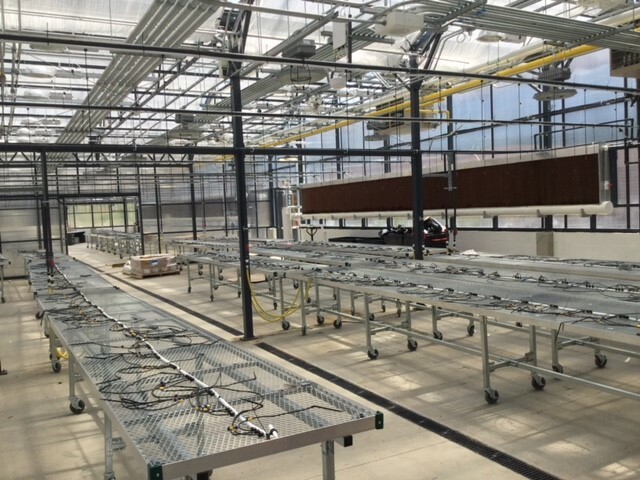 For example, our scope included systems for compressed air to the auto shops, oxygen and argon/CO2 gases to the welding lab; vacuum air to the dental lab; dust collection for the makerspace, woodworking and welding labs; natural gas and compressed air to the paint booth; and the irrigation systems in the greenhouses. 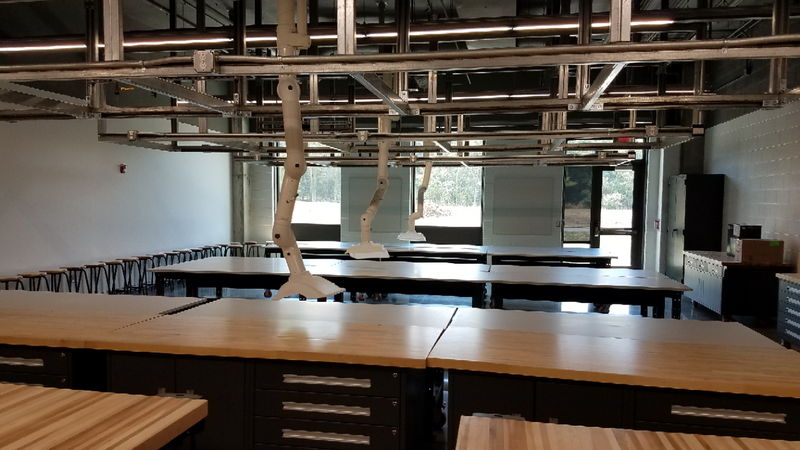 All of these mechanical systems serving end user equipment would need to fit properly, along with the other trades, in the exposed ceilings in the corridors and classrooms – even down to such minute details as the alignment of sprinkler heads with lighting fixtures. 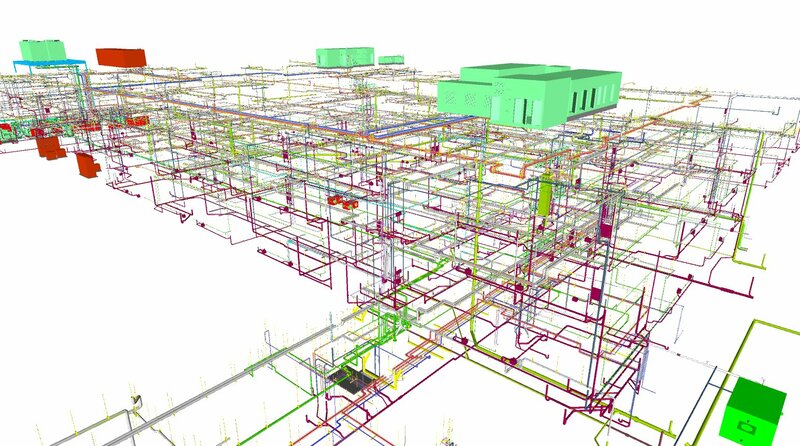 For our Virtual Design and Coordination (VDC) team, this presented the challenge of developing and maintaining 3D coordination models, using our leading-edge building information modeling (BIM) system, to ensure proper mechanical fit and smooth operation. Given that this was a design/assist project, our VDC team had the added responsibility of working with the design team and county plan reviewers and inspectors to modify the complex mechanical design as it evolved on site. Keeping everything code complaint was especially challenging when it came to the below grade plumbing work. Making these code compliance modifications virtually, using BIM to build the 3D models that ensure everything fits, would be of utmost importance in designing a cost-effective mechanical solution for this project. Our VDC team would also need to draw upon its wide-ranging experience with end-user systems and equipment to devise design models that would work on the job. In many instances, our VDC team needed to create 3D models of equipment from scratch because models were unavailable from the manufacturer. In addition to ensuring code compliance and functionality, are responsibilities also included guaranteeing manufacturer’s service clearances were represented in the model. An example of this was working hand in hand with the manufacturer of the dust collection systems and our ductwork subcontractor, to ensure proper layout of the fans, dust collectors, and downstream ductwork serving the end user equipment consisting of band saws, routers, engravers, and welding booths. Another example was the delegated design our in-house mechanical engineers performed for the intake and exhaust ductwork for the shop paint booths. In working with our sheet metal subcontractor we were able to model the duct risers to ensure constructability and fit within the shaft prior to any fabrication. Being able to interpret the architectural equipment plans, to determine where a final piece of equipment is designed to be placed and how it connects to other system components, was also key. In some cases, our team members would need to cross-check several drawings and installation manuals and research specifications online using only a manufacturer’s name and model number. This need for equipment cross-checking proved to be much more complicated than what our team normally deals with in a typical high school construction project. Such examples include determining the sleeve placements, prior to the concrete deck pours, for the floor plumbing rough-in’s serving the specialty pedicure chairs, hair washing stations, and dental exam chairs. 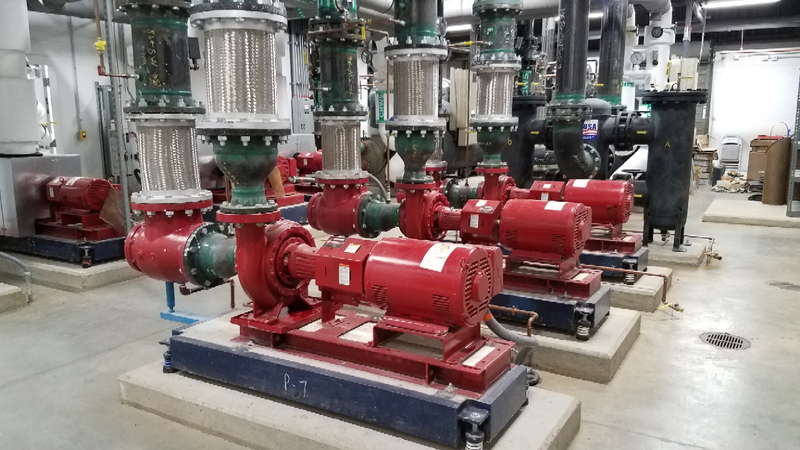 Ultimately, using BIM to model mechanical system connections in 3D proved to be a huge advantage over trying to figure this out in the field using 2D drawings. During the course of the coordination process, our VDC team was able to conduct periodic “virtual quality walks” with the design team to help ensure modeled mechanical components were properly aligned before they went to prefabrication. This was especially important in those corridors and classrooms with exposed ceilings where aesthetics were equally as significant as functionality. Shapiro & Duncan’s 51,000-square-foot prefabrication facility in Landover, Md. is always part of our mechanical solutions, and on this project that proved to be especially true. Being able to translate our VDC team’s virtual models to our fabrication shop is how we are able to put the pieces of the mechanical puzzle together for our field team. On the Academies of Loudoun project, approximately 85 percent of the mechanical systems were prefabricated. That proved to be a major key in sticking to the tight completion schedule for this project. Using BIM in tandem with prefabrication proved to be the winning combination. Productivity/Cost Savings: There is no doubt. 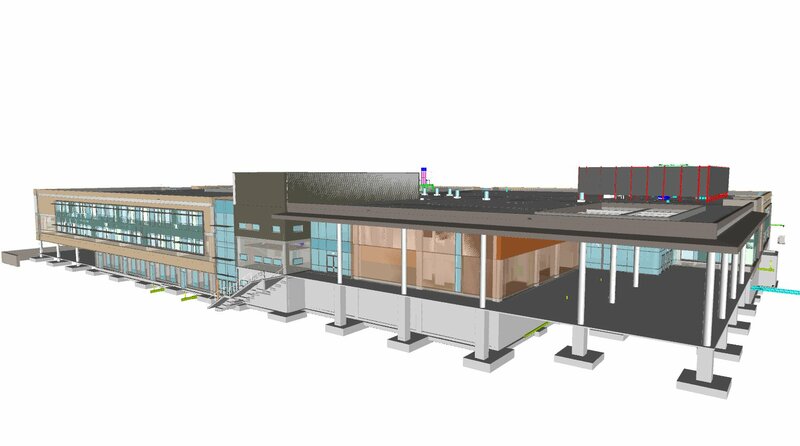 On the Academies of Loudoun project, BIM saved time and time is money. When coordination is done using BIM, the degree of certainty that everything will work together as designed is extremely high. The BIM team can see that it works in the virtual world. There is no guesswork. Clash-detection through BIM saves time up front. If conflicts do arise and RFIs are needed, they can be generated early in the construction process. And when 3D BIM models are transferred to the controlled environment of the fabrication shop, additional time and cost savings are realized compared to “stick building” mechanical systems in the field. Waste Reduction: Being able to build mechanical systems virtually means not having to tear-down and re-do in the field. The work is installed correctly the first time. This results in more efficient use of materials and less waste. BIM also allows us to translate 3D to 2D so we can generate material lists directly from the model via spool drawings. Only the exact materials needed for the task are ordered. This cuts down on over-ordering and excessive handling of materials. Safety: There are clear safety advantages to using BIM. An example was the use of BIM to visualize and create our plan for safe delivery and rigging of the mechanical room equipment. We were able to use the model to determine staging of equipment within the mechanical rooms and build a rigging plan. Also, the fab shop is a much safer environment for mechanical assembly compared to the job site where there may be several other trades working in the same area, a crane making a pick overhead, or weather related factors that could affect safety and efficiency. Fitters and welders fabricating large bore chilled water piping in a shop environment are much safer than stick-building the work on ladders or lifts in the field. BIM and prefabrication clearly reduced our exposure to potential construction hazards. Quality and Workmanship: Again, the controlled environment is key to top-notch mechanical quality and workmanship. For example, the assembly of VAV coil hook-up packages can be performed more effectively, on a consistent basis, in the fab shop than in the field. On this particular project, the virtual quality walks mentioned earlier in this case study were another key to quality control because they enabled the BIM and design team to collaborate and resolve all design and constructability issues before fabrication and installation. When we look at BIM as a success factor in a mechanical construction project as complex as the Academies of Loudoun, size really does matter. The percentage of mechanical design and construction work our team was able to do virtually, and then prefab in our dedicated fabrication shop, is a clear differentiator for Shapiro & Duncan. Thanks to BIM and prefabrication, our design/assist team was able to produce a state-of-the-art mechanical solution for the Academies of Loudoun that will enable this first-of-its-kind educational/technical facility to realize its objectives for collaboration in a unique open-space environment. Not only does our system have the needed functionality, but it also has the desired aesthetics.